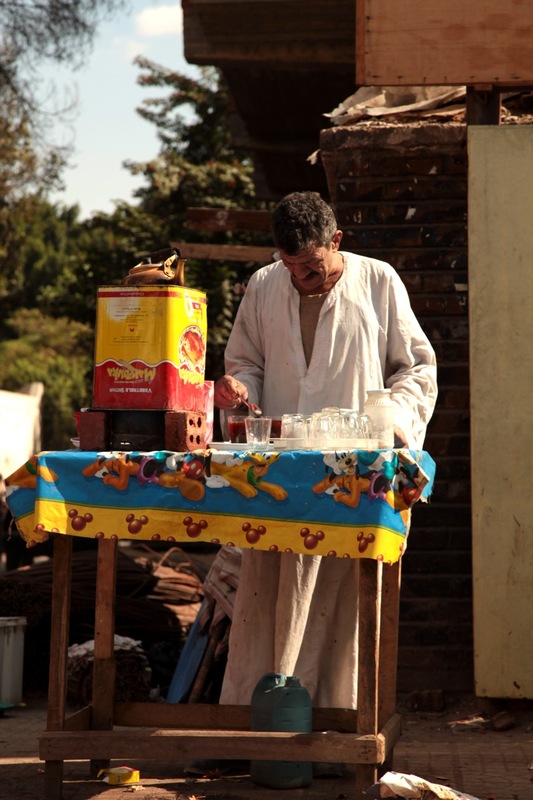 If you don’t feel like taking advantage of free water, you can also buy tea, roadside, here in Cairo. Tea is spooned, loose leaf and powder-fine*, into glasses with a generous helping of sugar (two, usually three, spoonfuls is the typical dose in those small glasses unless you ask for none or less) and then the whole is left to settle as it steeps. The last drink is tricky, trying to get the maximum of tea without ending up with a mouthful of dregs. One thing I absolutely love is seeing how people still use glass glasses and mugs instead of plastic. Cheaper in the long run and sustainable. I’m not sure you can tell but even in the first glimpse I posted, the worker who arrives with his tea is using a glass mug. You often see taxi-, micro bus-, and tuk-tuk drivers with their glasses in hand. BTW, I’m uploading the picture in large format so that if anyone curious can zoom in and look at the set up: the homemade stove on bricks, the copper teapot... Sorry for the quality; I snapped the pic from a moving vehicle. * It is actually labeled "dust tea" on the package. **THANK YOU SO MUCH** YES these *details*! Of this stuff is life--and novels--made. going to post that other one to Tumblr now. Funny how the charm of the place comes to life for me when I go back through these photos (which so far have dated to our first month here).